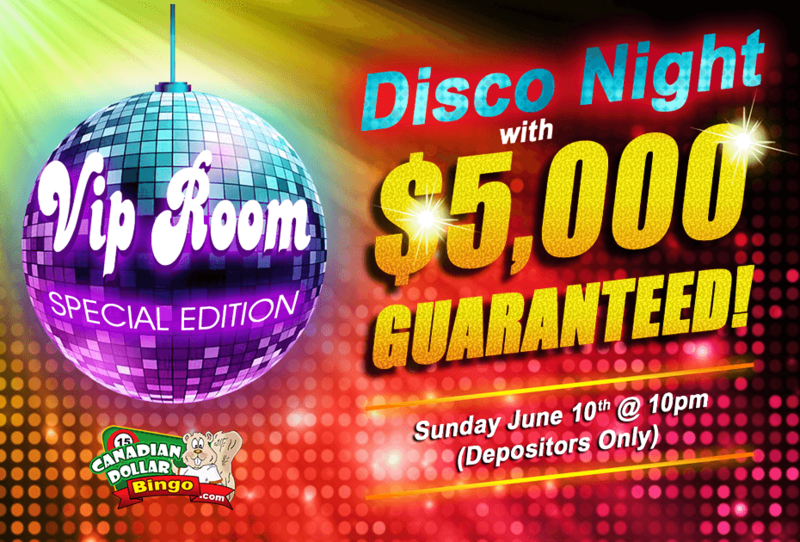 We are going to party like its 1979 at Canadiandollarbingo.com… Catch the disco fever, get your groove on, and join us this Sunday June 10th 10pm in the VIP Room to win your share of $5,000 in GUARANTEED CASH. Hustle on over to play (TEN) $500 GUARANTEED CASH GAMES for a single flat fee! Have fun playing the Camera, Head stand, Peace and Love Sign, Disco Ball, and the Dance Floor patterns, each paying a minimum of $100 CASH – You MUST DEPOSIT and REGISTER in order to attend the party. Register NOW! The end of the 70's era is back just in time for the weekend, lets party like the good old times. Bingo, Bingo, Bingo till you drop. Are you ready to bust a move? Join NOW! New members get a $50 FREE trial bonus and new depositors an incredible 1000% Welcome Bingo Bonus Deals. See you all in the bingo rooms, cant wait to see you show off your bingo moves on the dance floor. This entry was posted in Blog on Jun 6, 2018 by Canadian Dollar Bingo.